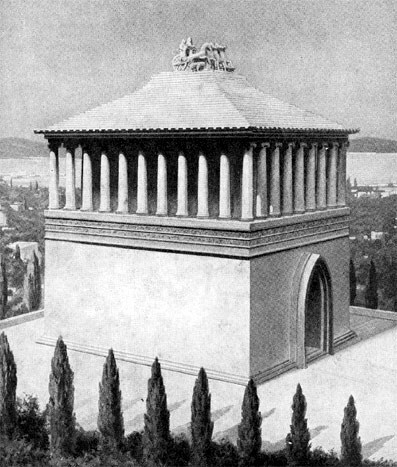 This striking reconstruction of he famous tomb of Mausolus at Halicarnassus, now Budrum, Asia Minor, is based on a model in the British Museum constructed after recent investigations into the details of the building. King Mausolus, whose name lives in our language in he word "mausoleum", ruled Caria, from 387-353BC as a satrap, or a provincial governor, under the Great King of Persia. The stately monument raised to his memory was inspired by the grief of Artemisia, his widowed queen. Accounted as one of the Seven Wonders of the World, it stood 140 feet high.